I do like txt format, often called "plain text". I agree with Joel Spolsky that, strictly speaking, There Ain't No Such Thing As Plain Text. "If you completely forget everything I just explained, please remember one extremely important fact. It does not make sense to have a string without knowing what encoding it uses. You can no longer stick your head in the sand and pretend that "plain" text is ASCII. ... If you have a string, in memory, in a file, or in an email message, you have to know what encoding it is in or you cannot interpret it or display it to users correctly." (See Joel on software.) You don't even need to be a programmer to know this. You'll find out the truth of this statement, if you use a software program that expects UTF-8 and try to open a text file that is encoded in ANSI. I know that there are some text editors that have under "save as" the entry "normal text file," but Notetab which I use for most of my text needs has four different entries under encoding. But all that being said, "plain text," as compared to "rtf" or proprietary encodings, still makes sense. As long as you remember that it really means only "minimal encoding," it is no more harmful to speak of "plain text" than it is to speak of "the rising sun." One of the reasons I like the "Todotxt" format is that it is plain text. It took a long time for me to warm to it. The reason for this was that originally it consisted of scripts meant for the command line. And I do not like the command line. It isn't so much that I am scared of it, but rather that it does not appeal to me. It reminds me of the days in which you had to type DOS commands for any program to do anything. I am glad these days are over (even though I amaze even myself that I still remember the commands when there is a need). jrnl is a program that promises you to be able "Collect your thoughts and notes without leaving the command line." In other words, it is a journal application. My problem is, of course, that I would first have to open a command line and then leave it as soon as I am done with jrnl. That is why the other advertisements leave me cold: It is "human friendly" because "jrnl has a natural-language interface so you don't have to remember cryptic shortcuts when you're writing down your thoughts." It "Future-proof" because Your journals are stored in plain-text files that will still be readable in 50 years when all your fancy iPad apps will have gone the way of the Dodo." It is "Secure" because you can "encrypt your journals with the military-grade AES encryption. Even the NSA won't be able to read your dirty secrets." It is "Accessible anywhere" because you can "sync your journals with Dropbox and capture your thoughts where ever you are." It is "DayOne compatible" and allows you to "read, write and search your DayOne journal from the command line" etc. Well, I like to use DayOne the way it is intended to be used. Still, others who are more inclined to be luddites (no disparagement intended) might like it. "In 1977, Eco published a little book for his students, How to Write a Thesis, in which he offered useful advice on all the steps involved in researching and writing a thesis—from choosing a topic to organizing a work schedule to writing the final draft. Now in its twenty-third edition in Italy and translated into seventeen languages, How to Write a Thesis has become a classic. Remarkably, this is its first, long overdue publication in English"—or so you can read on the page by MIT Press that advertises the book. I read the book a long time ago in German. I found it interesting then. Don't know how interesting people will find it now that computers and software programs have changed the way we take notes. I did not feel that it "reads like a novel," but did not consider that as a shortcoming. As you might gather from my blog, I found Luhmann's writings on note-taking more exciting. You will perhaps not be surprised that index cards play a large role in his inventory. Accordingly, one chapter is entitled: "The Work Plan and the Index Cards". It's expected to be published in February and the price of the paperback is $19.95. I have always had my suspicions. But Josh Parsons actually argues that it is. And he knows what he is talking about. I have only dabbled in it. His main reason is that it is an operational language (like C or Python) and not a declarative one (like HTML or Markdown or Wiki Markup). It is possible to write a document using only the markup-like subset of LaTeX, never defining any new commands or environments, and avoiding any commands or environments that assume that the output is to be a printed document. If you absolutely have to use LaTeX to prepare an academic paper, this is the best thing to do, and in academic disciplines where LaTeX is routinely used, graduate students are taught to do this when they learn to use LaTeX. The trouble is that this removes all of the flexibility and power that makes LaTeX so fun to work with. And for most purposes (i.e. unless you make extensive use of LaTeX math mode) it is easier to write a document in a declarative markup language such as Markdown which can readily be converted into LaTeX (but not of course vice versa). Talking especially to philosophers, he finds: "The use of LaTeX to prepare ones academic papers is just another instance of this phenomenon - giving ones papers the outward appearance of a paper in physics or mathematics in order to bask in the glow of intellectual seriousness and indispensability that we attach to those disciplines. But using LaTeX does not make you a mathematician any more than building a runway makes you an airport." I downloaded RedNotebook again. I am not sure what has all changed since the last version. Nor am I sure that it is any more useful to me now than it was four years ago. But I am less bothered by the lack of differences between edit and view mode. Changing the font size in edit makes a big difference. text: "This is another text entry, shown in the main text area." Entries can be saved in a DropBox subfolder. RedNotebook does not allow for link between different days. It is, however, quite adept at handling links to files and webpages. So, you could have this expression [January ""C:\Users\Manfred\.rednotebook\data\2015-01.txt""]. It links to a RedNotebook file and opens in your word processor. What was somewhat amazing to me was that it also allows for links to ConnectedText urls, like this [link ""ct://Journal/20150127""]. I do like the application and wish I had a use for it—"crimp, crimp"—but I don't. I'll keep it on the USB stick that I keep for such applications. 1. 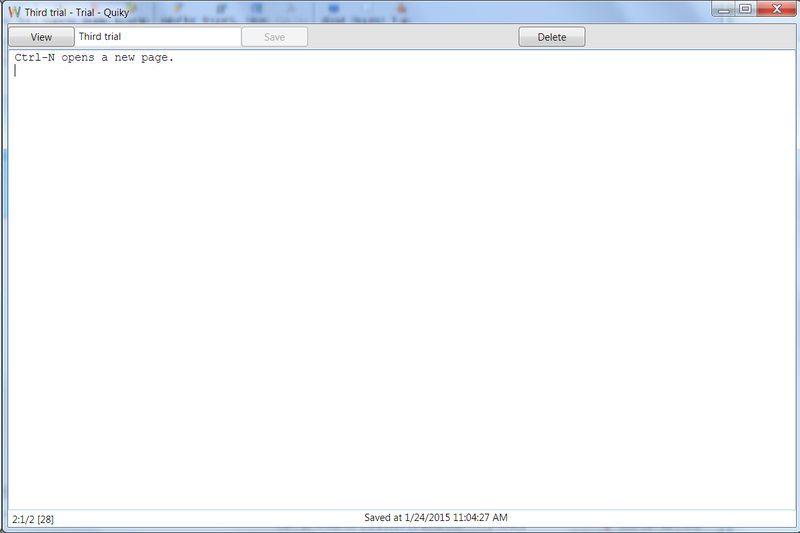 For a real basic "plain text" journal, see Plain Text Journal. I would download the stand-alone exe file. I have changed the markup of Wikidpad so that it is almost like that of ConnectedText. (If you want to see how it's done, see here for a starting point.) Wikidpad is the most powerful of these, but it amounts in the end to nothing but a jumble of Python files to which I would never entrust my notes. My trouble, if trouble it is: I like and rely too much on ConnectedText to use any of these applications as more than a supplement to it. I have written about doing things in plain text before. Even though I am not a purist, I believe that plain text has many advantages. Accordingly, I like TodoText very much. But I do not go as far as Michael Descy whose Website Plaintext Productivity I truly admire. I have learned from it, even if I have translated many of his ideas into my ConnectedText setup. I recommend the Website highly! (4) and (6) constitute an anachronistic account of commonplacing. The idea was to arrange the passage around common places, i.e. according to what everyone would consider a common place just because it was a place in the known ordered universe. This was the way people kept commonplace books until roughly the end of the seventeenth century. John Locke, who proposed a new method to arrange the headings according to an alphabetical scheme, though he himself remained very much captive to the original method. His "ideas" correspond very much to commonplaces. To make "a book of your own, one stamped with your personality" is a notion that belongs to later times, not to a period in which to "invent something new" was considered bad. If you find that hard to believe, look at the rules and regulation for the guilds of tradesmen and artisan that expressly forbade the invention of new things. It may have been a good thing that the guilds were prohibited in the eighteenth century—at least for the new ways of doing things in the trades. But it seems to me more certain that overcoming the commonplace method in note-taking was essential for the sciences and our conception of "personality." 1. See Erasmus on Commonplaces. A commonplace book is what a provident poet cannot subsist without, for this proverbial reason, that ‘great wits have short memories:' and whereas, on the other hand, poets, being liars by profession, ought to have good memories; to reconcile these, a book of this sort, is in the nature of a supplemental memory, or a record of what occurs remarkable in every day’s reading or conversation. There you enter not only your own original thoughts, (which, a hundred to one, are few and insignificant) but such of other men as you think fit to make your own, by entering them there. The passage is quoted in many places as positive advice. It should be clear, however, that Swift is deeply ironic, if not sarcastic or downright satirical. The "advice" is just as little serious as the observation that "it may be necessary for your ease, and better distillation of wit, to put on your worst clothes, and the worse the better; for an author, like a limbeck, will yield the better for having a rag about him." A commonplace book is common or trivial for Swift, and so will be the writer who relies on the "few and insignificant" original thoughts likely to be contained in it. He would have chuckled at the people who take his mockery seriously as advice to be followed. I am sure he would have thought that they prove the very point he wanted to make about modern letters. I am sure that almost everyone who quotes the passage has not read it in context. I tend to agree with Swift that commonplace books have had their day, and that they represent a way of supplementing memory that is best forgotten. Didn't know that Reagan was an afficionado of the notecard method. He must have had many secrets, but one of them was "a stack of 4 x 6 inch note cards that he compiled over the span of four decades. Consisting of quotes, economic statistics, jokes, and anecdotes, they became the core of Ronald Reagan’s traveling research files." I have just learned this from a a review of the book: The Notes: Ronald Reagan’s Private Collection of Stories and Wisdom (Harper, 2011) edited by Douglas Brinkley. "The cards would feature between five and 10 items and would be written on both sides." This does not seem like a good system. In fact, it's hardly any system at all, but it apparently helped not just his speech writers, but it also helped him remember his one-liners. Here are some pictures of his cards. This also seems to hold for writing and thinking! I sort of knew this, but I never integrated it into my conscious life. It's the "opposing forces" that got in the way! Often you are not aware of what they are. "Powering through" or "removing" them presuppose that you know them! Quiky is a very rudimentary wiki app. It is available for Window, as well as iPod Touch and iPhone), and the Android. It does not do much. Basically, it allows you to create and edit pages, and then to link it, using free links (double brackets). No fancy formatting. In fact, no formatting at all. (Nothing wrong with that, as it makes no claim that it can format.) Accordingly, the interface is minimal (both in edit and view mode). 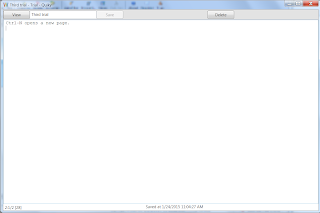 In order to save a page in the Windows version, you press on the save button (Win+S will also work). Apparently on the iOS version, it saves automatically after 5 seconds. I have found no shortcut for the view mode. Search is non-existent, so it is obviously not designed for large wikis. Nor is it a large application. The download of the last version is only 85 kB. Is it ugly? No, I agree with the developer: "it's rather just simple, I tried the same approach, as with the app. The website is in fact web-based Quiky. In the future, users will be able to edit their wikis here.It's already in working stage, but only for a single user." He follows "the KISS approach ("Keep It Simple, Stupid! "), so I defined a roadmap with a few features in every new version." And that's fine with me. The developer promises that in the future, Quiky wikis will be able to be edited from the Website as well. Don't know whether that is important to me! What is more important is that "Wikis are available for download to / upload from a desktop app via iTunes File Share feature." This means that you can sync your desktop and your iPad. 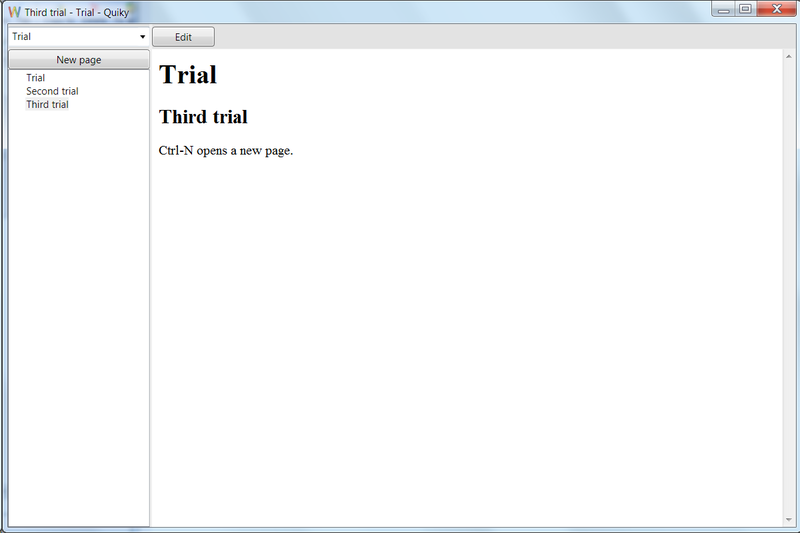 The files are just txt, though the names have the expression "%20" for spaces in their names, like "Third%trial.txt". 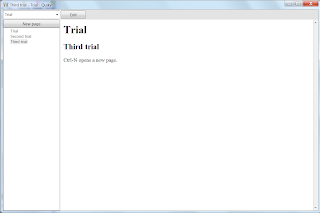 The files import unproblematically into an application like ConnectedText, but the name remains something like "Third%trial.txt". I haven't made up my mind whether this is good or bad. I obviously am thinking of using Quiky as a complement for ConnectedText on the iPad, and it might be good that the topics imported from Quiky are clearly identifiable. That way, they won't over-write anything important. And it should be easy to rename them. I like Quiky just because it is rudimentary, but I know that some people might dislike it for that very reason. 1. Apparently, the iPad version is not quite ready. I hope it will be soon. 2. I am looking here at the Windows application. For iPhone screen shots, see here. You can download it from here: https://www.apple.com/downloads/dashboard/reference/wikitywidget.html. Am I going to use it? Probably not. "Katana" means something like "samurai sword," if you believe Wikipedia. Apparently, some people collect such things. But the "Katana" I am referring to is something of an nVALT clone. You can download a trial copy from here. It's an interesting application, but it has not been developed now for more than a year, and it does not do everything nVALT does. It also costs $9.99 on the Mac App Store. There is an informative review of Katana here which is to say that this review motivated me to take a look at the application. One of the things that interested me most was, of course, whether it could do free links like nVALT. It does—sort of. In nVALT, when you enclose a word in double brackets, the program puts that word on the search bar, hitting return creates the note by opening it for writing. nVALT does not seem to care about the case in a note name. Nor does it keep track of the links to renamed notes. (If you rename a note, the old links still point to a now non-existent note. Clicking on the old note just creates a new one.) For anyone used to wiki-functionality, this is a serious drawback. Katana does not use double brackets but the expression <""> to enclose links, like so "<"link">". It does not create a note, if you type a word enclosed in these links. You must create a new note by hand for transforming the expression into a link. There is not even a line in the context menu that would create it. Just like nVALT, Katana does not care about capitalization in note-titles, and, just like nVALT, it does not track tile changes in linked notes. So, if you rename a note, the link will be broken. Katana only deals with individual text files in a folder (no database option). It supports Markdown. If you save the files on a service like dropbox, its files can be accessed from anywhere, using different kinds of editors. You kind specify the place where files are stored. I came across this observation this morning: "If I don't take notes, it would be like a long dream. When I wake up, I know I had a long dream and I might remember the emotions, but after a few minutes the details are gone" (here). It's fundamentally correct and holds for almost everyone. I almost said: "I couldn't have said it better myself," but that would be false. It's more like: "I couldn't have said it as well" even though I have my doubts about whether web could be thoughtful (which is not the fault of the contributor to this site, of course). I sometimes feel as if I have dreamed my life away. My consolation: many of the papers I attended during the last thirty years of my life probably were only good for dreaming, but I will never know. If you wonder what that might be, see here. Actually, it is not just "natural note taking," but "premium natural note-taking." As you might well expect, I don't think that there is any "natural note-taking." It's an acquired skill that can—at best—become second nature. And "premium natural" seems to me a contradictio in adiecto. This is not to disparage the application, but only the advertising for it. It's too easy ... I know, but I can't help myself. I especially like the recent advertising for Dunkin Donuts that I noticed last week: "You name it, we brew it." A word that I won't spell out immediately came to mind. 1. It's a four-letter word that starts with "sh" and ends with "t'. make two kinds of purchases. We buy things: clothes, cars, and home goods. We buy experiences: meals, vacations, and movies. Sounds good, doesn't it. But is it really that obvious? What do I buy when I buy a book or note-taking software? A thing or "stuff," or am I buying an experience? Well, first of all, I'd like to think that I am buying something that will afford me an experience, or rather, that it will help me to learn or experience something. I do agree that experiences might be a better bet than mere stuff, but as I just said, I am not at all sure that "stuff" and "experiences" can be that cleanly separated. Secondly, and perhaps more importantly, I don't think that experiences can really be bought. It must be made by us. It's like love that way ... Call me old-fashioned. The very claim that that "buying experiences makes us happy" shows how far consumerism has corrupted us—or has it only corrupted the "happiness experts"? My resolution: I am going to go for the priceless experiences in 2015! 1. Read more: here. But this "wisdom" or "advice" can be found in many other places.